Do you ever wonder how your colleague that has the same amount or even more work than you manages to finish everything before you everyday? All this time, you’ve put it down to your assumptions that they must be doing a half-assed job, their work is easier than yours or even that they’re just naturally smarter than you. Well, all of that could be true. But it’s more likely that they know how to work. Habits of working efficiently is one of the easiest and most useful things to learn in your professional life. With just some practice, you can become the most efficient start employee in your company that has your colleagues wondering just how you do it. 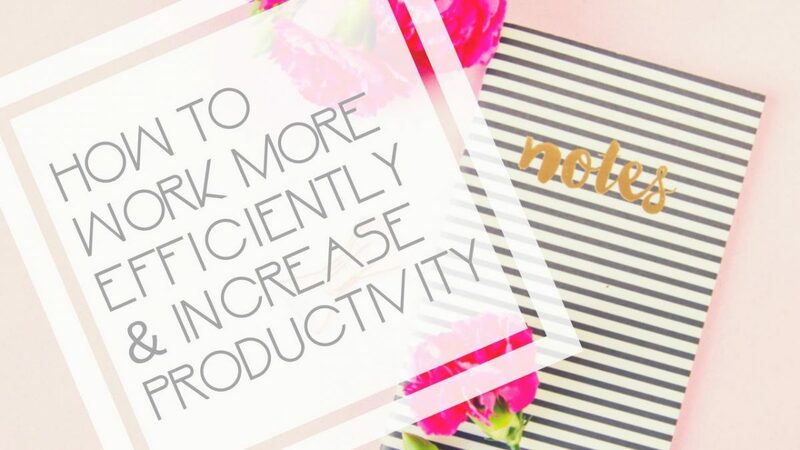 Practice these tips below and become one of the most irreplaceable members of your team and reduce the number of overtime you have to do to finish everything on your plate! 1. Plan for a specific period of time. Plan your work for the year, quarter, month, week and day, in order to stay focused on what you have on your plate and what has already been finished. If you can set your own projects, then make plans for them for the year and divide the tasks into smaller time periods. If your boss delegates projects to you, then make yourself a plan for what tasks need to be finished by when. Everyday before work, make a plan for the day that fits into the big schedule. 2. Have a big picture plan and goal. Having a bigger picture goal can help you understand what you’re working towards, instead of just doing mindless work. The big goal can be to finish a big project or a personal goal like getting a promotion. Whatever the goal, something that resonates with you can give your work meaning and help you stay on path. Having big goals can be a great way to understand what you’re working for, but can sometimes seem unreachable. So, set smaller goals as part of the big picture to help you keep track of your progress. Working towards a clear set of reachable goals can be a great motivation to help you stay focused and work more efficiently. Even the smartest people can be forgetful. When you have an endless list of things to do, you’re bound to forget some tasks sooner or later. Make a habit of jotting down everything you have to do as they come up. When you have the time, organise them in order of importance and urgency. Keeping on top of your daily and weekly to-dos can help you understand your outstanding tasks and break down your goals into tasks. Being able to multitask is not as great a skill as being able to focus on one thing at a time without being distracted by other tasks. If you’re working on one task, try to make that task the only thing you’re thinking about. When you try to work on several things at once, you’re not giving your all to each task and the work you produce won’t be as excellent as it could have been. No matter how boring or unpleasant the task, try not to delay it and just get it done. If you don’t do it right now or today, you’ll have to do it later anyway. This is where having goals and a to-do list can become useful. Knowing exactly what you need to and can finish in a given day will help you be able to just push through whatever task you might not want to do. Similar to focusing on one thing at time, focus on taking the break when you’re not working. Working through your lunch breaks doesn’t help anyone, as you’re unlikely to produce your best work when not completely focused, and you’ll feel more tired in the afternoon without having had any downtime. When on a break, don’t work and try not to even think about work. 8. Know how and when to distribute work. Working efficiently doesn’t mean that you can do 10 people’s jobs by yourself in one day. You may be able to, but that is not a great use of your time and skill sets. Know how to delegate tasks for a project and learn your team’s skill sets to understand how the project can be best managed. When a project requires teamwork, your efficiency is not enough to finish the project. It needs your whole team to be on board and you might just have to be there to guide them through it.